Well on his way to establishing a new personal record, and probably this forum's new record! Well, Pete, that looks super... Way to go. Since you have 45 on the 16 already, you may very well get to 80 or 90 (assuming you don't have any othe engagements towards the end of the month). Ok.. see you already got the answer. For call center supervisor Larry Pearce (Chris Bauer of THE WIRE, THIRD WATCH and 8MM), listening is a way of life. His days are spent monitoring hundreds of tech support phone conversations, his ultra-sensitive ears attuned to every nuance of voice and sound. But in the months following his young son’s tragic death, Larry’s hearing intensifies until it becomes virtually superhuman. Now simple noises around him have amplified into a cacophony of torment. And as Larry slowly begins to lose his grip on reality, he must take violent action to quiet the deafening clamor. In a world where nothing screams louder than the madness of grief, how far will one man go to find the ultimate paradise of absolute silence? Another Masters of Horror episode. Once again a blind buy as I never watched any of the episodes as they aired on Showtime. This one is a decent episode... though I wouldn't say a favorite. Maybe it is just me... but it seems like I been saying that a lot here lately... seems like season 2 has gone a bit downhill on this how. Not that it isn't still a good show... just don't seem to be what it was in the first season. There has been some really good episodes in the second season... but not as many in my opinion. 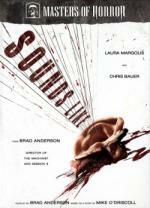 "Sounds Like" does not have the gore that is present in many of the episodes... but that is fine by me... a horror definitely does NOT have to have gore to be good. It seems to me that this one was a little lacked when it comes to extras as well... but that has seemed to be the case every since Starz took over for Anchor Bay. Over all it was a decent episode... I would suggest either catching it on TV or renting it before you decide to buy this one. A band of soldiers is dispatched to war games deep in the woods . When they stumble across a rival team slaughtered in camp, they realize they're not alone. Something deadly is waiting in the darkness: something not animal and not human. 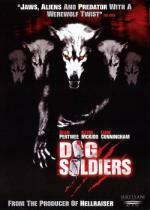 Holed up in an abandoned farmhouse, the soldiers start a bloody battle against the beasts. Dawn is only a few hours away but they may not live to see it. I bought this one several years ago while at Walmart one day... not only was it a Blind Buy at that time... but it was also an Impulse Buy... I spotted it up on the shelf... felt the front cover looked interesting and just tossed it into my cart... I remember I never even read the back of the box. Yes... back then I liked to gamble with the DVDs I bought a little bit. In this case the gamble really paid off... I enjoyed this movie from start to finish! I think I really liked this one because it is different then most werewolf movies what with it happening to a group of soldiers. For those concerned about gore... be warned this one has it's share. I definitely feel safe recommending this movie! Should show it to a friend of mine to see what he thinks about that (he's a surgeon). A sterilized form of superglue is frequently used instead of stiches or staples (depending on the injury). It's particularly good for children since other methods are much more traumatic. Exactly the answer I got when I asked my cousin (she's a nurse) that very question. An indescribable nightmare begins when a group of young friends is stranded on an isolated road deep in the Appalachian hills of West Virginia, with no hope of rescue. Desperate and fearing for their lives, the horror surges as they find themselves relentlessly pursued by a force of evil beyond their imagination! Featuring a hip ensemble of up-and-coming young stars, including 'Buffy the Vampire Slayer's' Eliza Dushku, this blood-curdling epic is a shock-a-minute horror rush that will leave you screaming for more! There really is nothing all that original here... group of friends... lost in the backwoods... being terrorized by some crazy redneck family. Seen it all 100s of times. But even so... there is something about this movie I just really like. Maybe it is because I am a fan of Eliza Dushku... I don't know... seems to be more then just that. anyway in my opinion this is a good horror flick... above average. I know it sounds like many other out there... but give it a shot. While the Huxtables plan their flashy costumes for Halloween, Claire gives Vanessa advice on how to tackle her first Halloween party and attract the affections of Robert, the coolest boy in the seventh grade. This episode is on a Columbia House Exclusive Best Of DVD that a friend gave me after getting the season sets. Until I got this disc today I completely forgot there was a Halloween episode of this show. This was a fun episode... I really enjoyed it. I think my favorite part of the episode was at the very end where Cliff and Claire had little Rudy running between each other telling her what to say to the other. I've never seen The Cosby Show. This is a long time favorite of mine. One of the best Haunted House stories I have in my collection. I missed this one when it originally aired on TV... but a friend of mine gave the DVD release to me for Christmas when it was released. Since then I have watched it every year during my annual Month Long Halloween/Horror Marathon. One thing I just noticed with this viewing is that one of the psychics is played by the star of the TV Series "Bones"... Emily Deschanel. I didn't originally recognize her as she has her hair blond in this movie. She also has a part in the horror movie "Boogeyman." If you have never seen this miniseries I would highly recommend checking it out! I am sure you won't be sorry. From Stephen King, the best-selling novelist of all time, comes the terrifying tale of a town besieged by evil. The inhabitants of a picturesque, sleepy little town on a small island off the coast of Maine find themselves completely cut off from the rest of the world when they are hit by the worst storm of the century. As snow steadily buries everything familiar, terror arrives in the form of an evil stranger. As streets disappear and an eerie darkness envelops the town, a series of bizarre murders creates a nightmare of fear. With no help coming from the outside world and no end to the storm in sight, the townspeople are forced to take drastic action before it's too late. This is another really good Stephen King miniseries... it is one I haven't watched in quite a while... so it was good to see it again. Being a parent I would have never been able to do make the decision they had to make. If you never seen this one I definitely recommend checking it out... I am sure you will enjoy it!